1. Anticipation, there is nothing as exciting as getting ready for a big day on the slopes. You prep your gear, spill coffee on yourself during the commute to the slopes, put balance on one foot putting on your ski boots in the cold snowy parking lot, then you lug your heavy ski gear to the lifts. Are we having fun yet? Answer, yes. 2. That first run, the snow sparkles like diamond dust, and the corduroy ripples perfectly, welcoming your signature turns. Aren’t you glad you got out of bed now? Even when the skiing isn’t great (read: icy, slushy, frigid, howling wind), it still beats working. 3. Mountaintops in winter are absolutely magical. Trees resemble snow ghosts draped in heavy frost, and the valleys and hillside below are framed in panoramic photo. 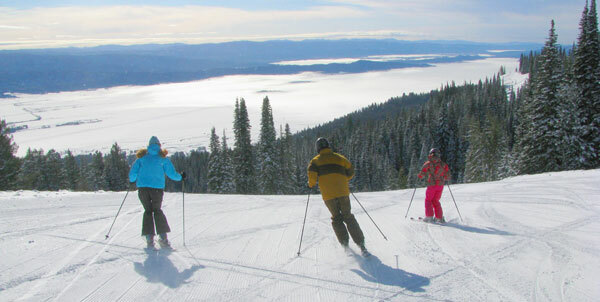 See our Top Ski Trails in the East for examples. 4. There is the sensation of dancing on snow, as you unweight from ski edge to edge, rocking your boards back and forth feeling the G force of each turn completion to the initiation of the next. I don’t know about you, but this is way better and bigger than any dance floor in any crowded club. 5. Meeting new people on the chairlift is a bonus. You have alpine passion in common already. Everyone has at least one engaging ski story to tell, and if it’s boring, the lift ride will be over soon. Just don’t chat on your cell phone on the gondola. 6. Skiing is the one sport where your kids will think you are cool. 7. You can ski from age 3 to 83, and the older you get the better the ski ticket deal (free skiing for seniors). I love skiing with my Mom, she’s well into her 70s. 9. Apres Ski – the after burn in your thighs after a big day skiing is a sweet soreness. Whether you track your vertical, count your runs or your ski days, or just ski till you are wiped, that post-ski fatigue comes with a sense of accomplishment and a side of endorphins. Everyone, including the kids, will sleep really well after a big day on the slopes. See The Top Apres Ski Bars in the world, and The Best Après Ski in the East. 10. You can’t après ski until after you have skied.